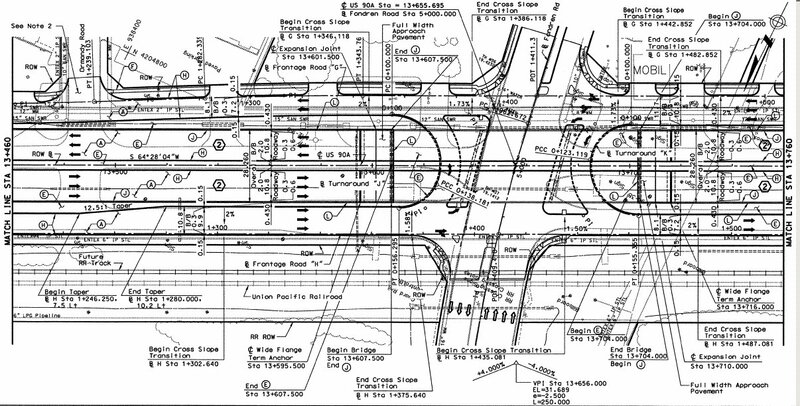 US 90 will be Houston's first, and hopefully only, "mini-freeway" or "superstreet." (I consider Memorial to be fully access controlled for it's freeway-like section.) The facility is fully grade separated at all intersections but is not controlled access. The median will have a few, widely spaced breaks in it to allow left turns. 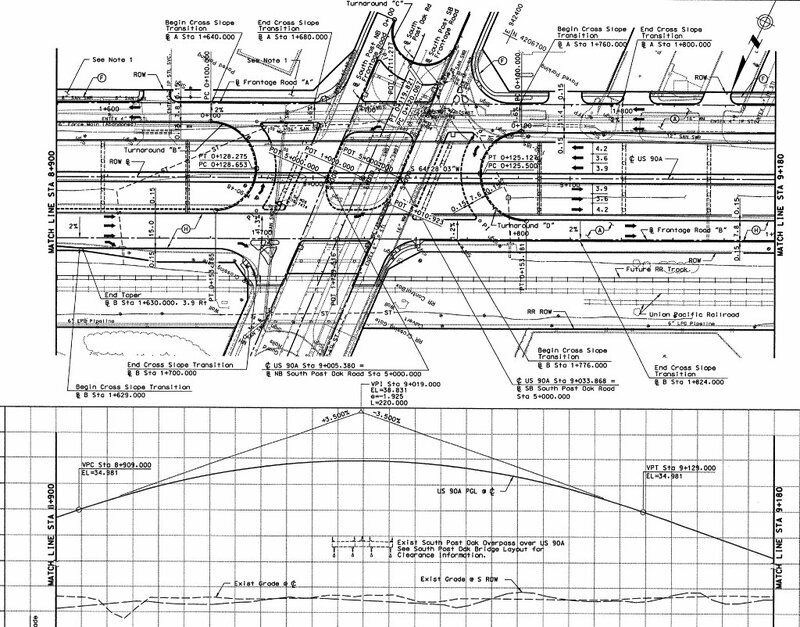 All overpasses will have six lanes, and between overpasses the roadway will generally have 8 lanes. 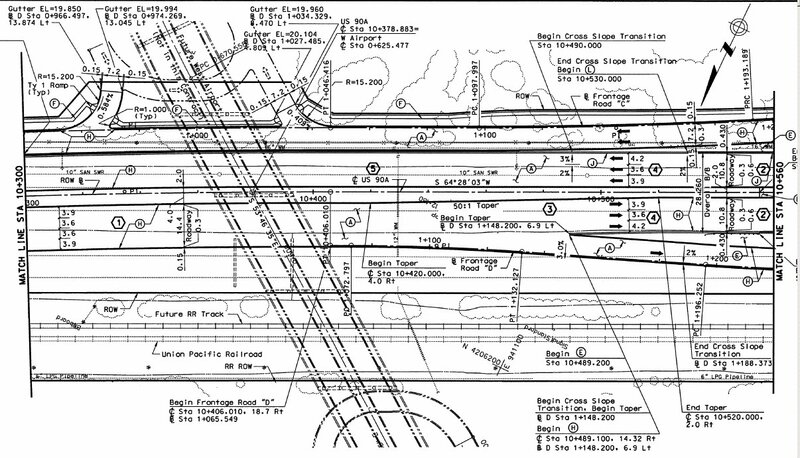 Since there is a railroad track on the north side of the right-of-way, the westbound lanes will effectively be access-controlled since there is no property access over the railroad tracks, except in one location just west of Hillcroft. So is a mini-freeway a good thing a or bad thing? Well, that depends on the alternative, of course. It's a bad thing if the mini-freeway is being built instead of a fully controlled-access freeway. It'a a good thing if the other alternative was a facility with traffic lights. The improvements to 90a will be a great benefit to motorists since the traffic lights will be eliminated. Still, I feel that this corridor should have been designated as a full freeway to provide an alternate freeway route to US 59, the Southwest Freeway, which is possibly the busiest freeway in the United States at 371,000 vehicles per day. The southwest freeway will be very difficult to further expand because it has maxed-out its right-of-way; at this time, no further improvements are plannned for the section of US 59 north of US 90A. 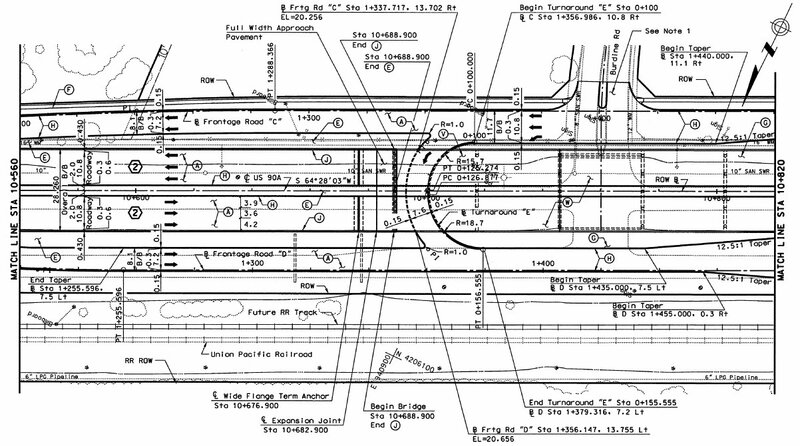 I don't know the factors that played into the decision to build the "mini-freeway". 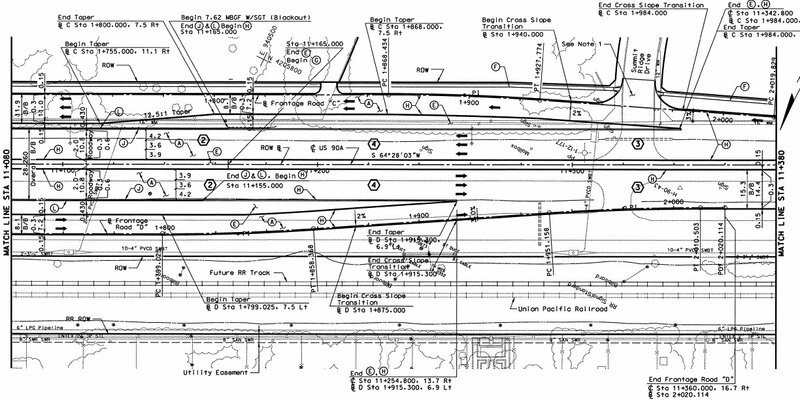 I assume cost and the need to acquire a lot of right-of-way were at the top of the list. Location map. The proposed Fort Bend Parkway Tollway is shown in blue. South of Beltway 8 it is nearly certain to be constructed. 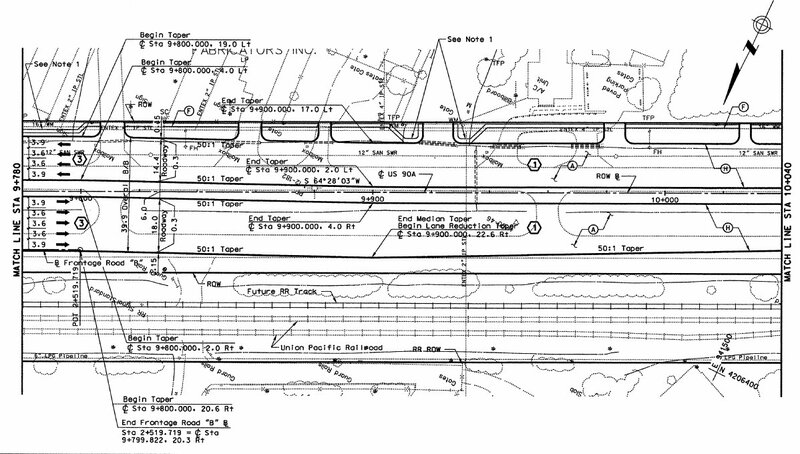 Between Beltway 8 and IH-610, the project is under study. As a point of historical interest, this section of US 90A was one of Houston's first divided four-lane highways (or dual-carriageway, as it was called back in those days.) 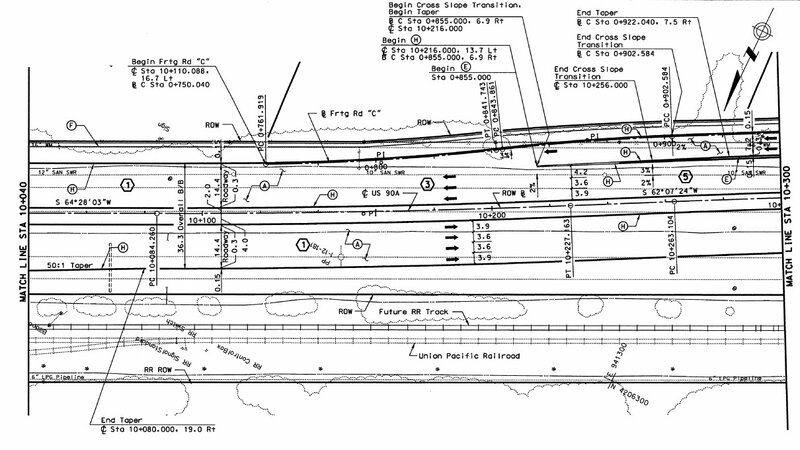 A 1952 map shows this section of 90A as a four-lane divided. 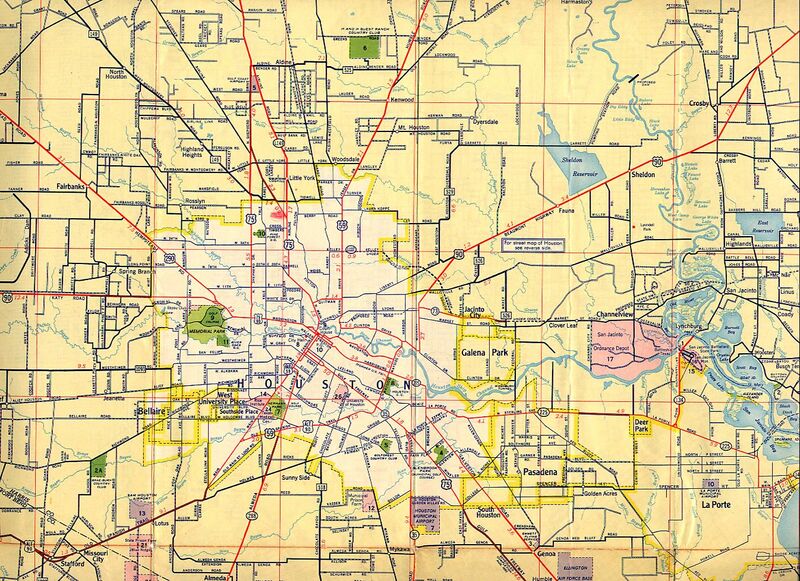 This route was signed as US 90A and also as US 59 at the time (see map). 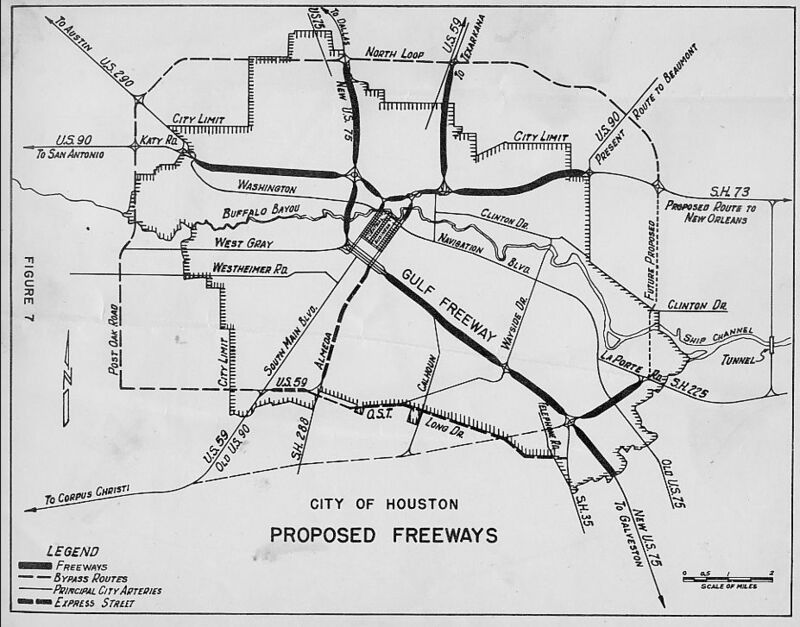 US 59 did not start to take shape until the early 1960's. 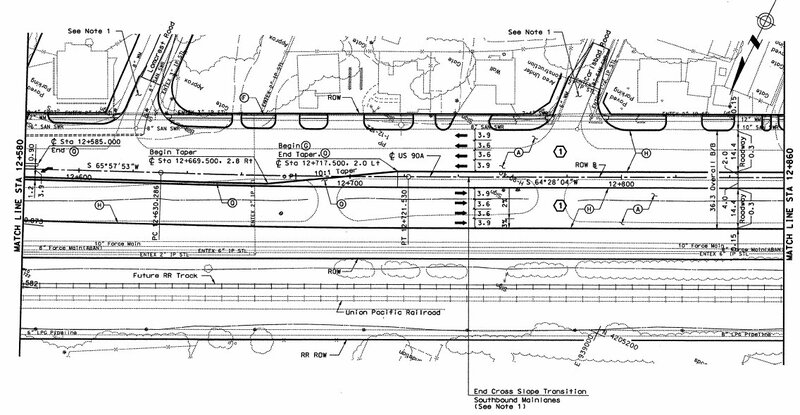 This shows the facility east of Post Oak Boulevard, with 8 lanes. Just east of Post Oak (219K) This view shows the facility just east of Post Oak. The through lanes are elevated and the frontage roads are at grade. At Post Oak (249K) This view shows the crossing over Post Oak Boulevard. Note that Post Oak is already an overpass over 90A. 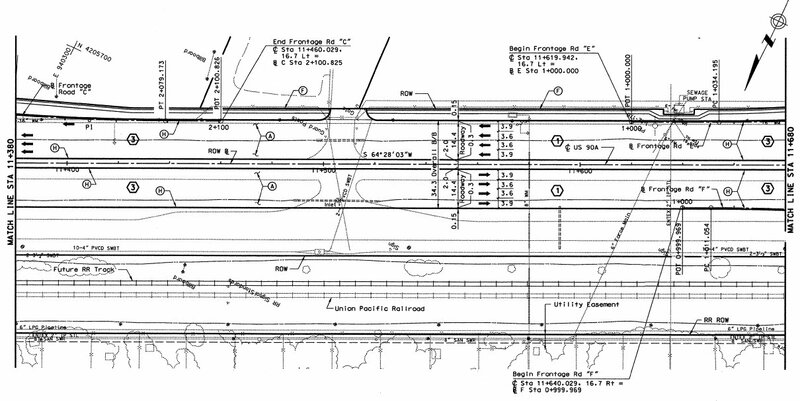 The new 90A lanes will go over the Post Oak overpass, which was constructed around 1984. 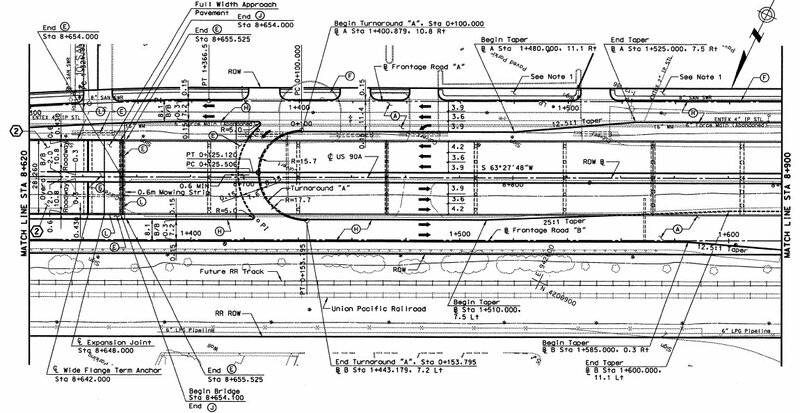 The schematic is difficult to interpret, but the roadway profile beneath the schematics helps clarify what is going on. Just west of Post Oak (232K) The transition zone is long because of the high crossing over Post Oak. West of Post Oak (252K) Here we see the frontage roads and main lanes merge back together. Notice the median cut to allow left turns onto Kylewick road. West of Post Oak (252K) Here we see the frontage roads and main lanes merge back together. Between Post Oak and Chimney Rock (233K) This is a typical section of roadway between intersections, with property access on the south (eastbound side), which is the top side in this view. Between Post Oak and Chimney Rock (202K) Notice the shift in alignment. 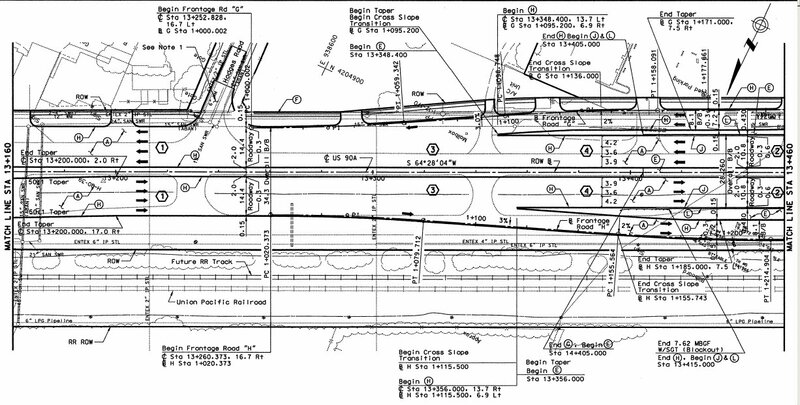 Between Post Oak and Chimney Rock (273K) West Airport Boulevard is planned to have an overpass over 90A at this point. The overpass is not part of this project. Just east of Chimney Rock at Burdine (239K) The overpass at Chimney Rock is extended eastward to accommdate a U-turn near Burdine Street. Just west of Chimney Rock (237K) The frontage roads and main lanes merge back together. Between Chimney Rock and Hillcroft (189K) A typical 8 lane section of roadway. East of Hillcroft (232K) The frontage roads diverge/merge from the main lanes. 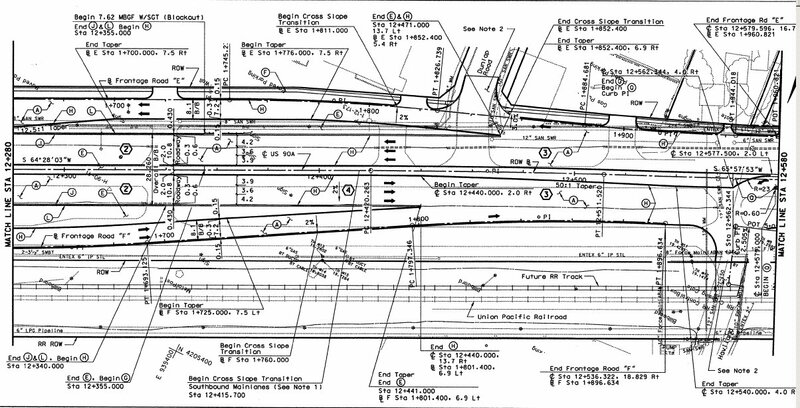 At Hillcroft (286K) Years ago I saw plans that showed a three level interchange at Hillcroft, separating Hillcroft from the railroad tracks. 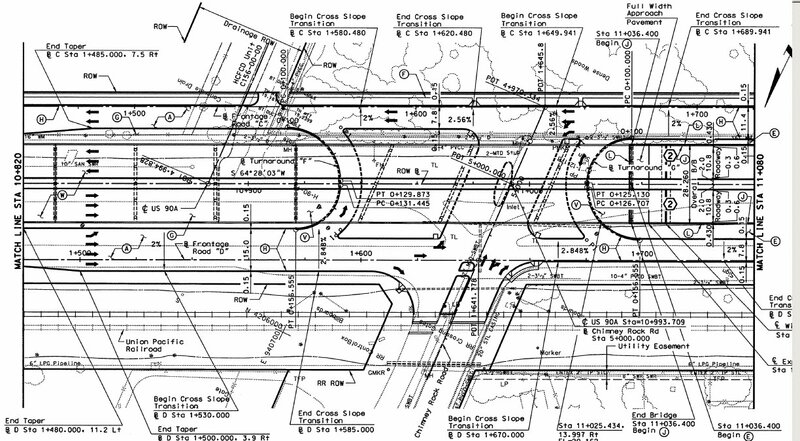 The final design is a standard 2-level interchange, with a railroad crossing. West of Hillcroft (266K) This view shows that there will be a median cut just west of Hillcroft to allow eastbound vehicles to make a left turn. This is the only point where the westbound lanes have a grade intersection. Between Hillcroft and Fondren (197K) This view shows a typical 8-lane section. East of Fondren (197K) This view shows another median cut to allow a left turn from the westbound lanes. Just east of Fondren (251K) This view shows the frontage roads exiting/entering the main lanes. At Fondren (287K) This view shows the Fondren intersection. West of Fondren (242K) This is near the western end of the project limits, approaching Beltway 8 (Sam Houston Tollway). 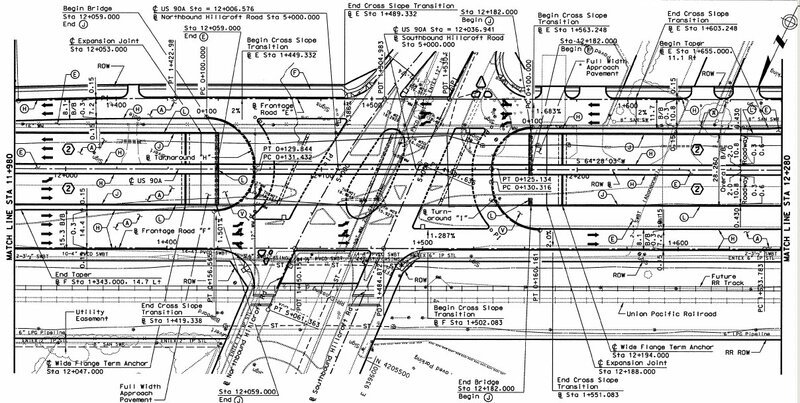 The intersection at Beltway 8 is already a three level interchange, completed around 1997.